The Art History Society of CSULA is proud to announce this year's Mesoamerican symposium held in honor of the late Linda Schele. 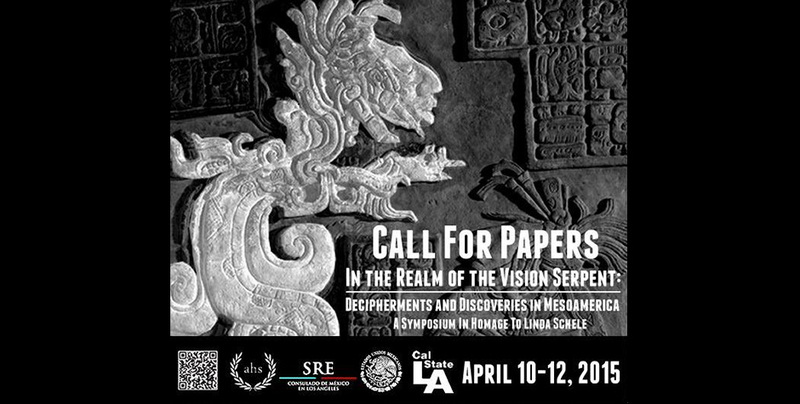 In the Realm of the Vision Serpent: Decipherments and Discoveries in Mesoamerica. A Symposium in Homage to Linda Schele will be held at Cal State LA from April 10-11, 2015. The symposium organizers are now holding a call for papers. Scholars and Graduate Students are encouraged to submit papers for individual or panels sessions that will take place over the two days of the symposium. Panels should contain 4 or 5 speakers. Individual submissions will be grouped into panels of related topics. Interested presenters please email a 150 word abstract along with a brief CV in PDF format to Hector Cordova (cordova631@gmail.com) and Dr. Manual Aguilar (maguila2@calstatela.edu). The submission deadline is December 31, 2014. In addition to the lecture sessions and featured speakers, the first day of the conference will include the opening of a Mesoamerican exhibition curated by John Pohl. The second day will continue panel presentations and featured speakers, followed by a short movie by David Lebrun about the life of Lind Schele and a ceremony of homage to Linda. David Schele will be in attendance to recieve the Tlamitini Award on behalf of Linda. On the second day there will also be a round table discussion in which 12 of Linda's students and close friends will share their experiences and anecdotes about Linda. The annual Mesoamerican symposium is noted for its multi-disciplinary and pan-geographic approach to the study of Mesoamerica. It is not limited to a particular geographical area or ethnic group and embraces perspectives from historians, anthropologists, art historians and other related disciplines. Additional details and a list of suggested themes can be found here.